Photograph depicts a group of graduates in the synagogue. 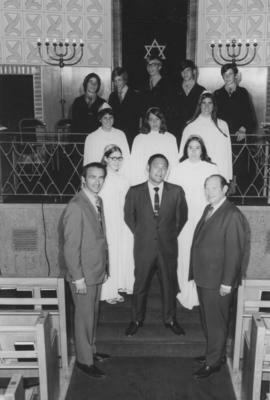 Photograph depicts a group of unidentified people, presumably graduates, in the synagogue. 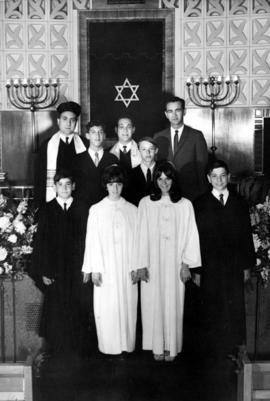 Photograph depicts a group of graduates from Beth Israel High School in the synagogue. Photograph depicts the graduates of Beth Israel High School, including (l-r) Saundra, Debee, and Shari Zack. Photograph depicts a group of children in costume for a parade in front of an unidentified building. Photograph depicts children dressed in costume for a parade with parents watching. Audio cassette depicts shots of picnics (likely of a Beth Israel picnic and a B'nai B'rith picnic), some shots of men fishing, and a parade.